Aurizon’s results reflect the current state of global coal markets. While haulage volumes have begun to stabilise (after a precarious start to 2016), management have outlined they expect volumes to remain flat over the medium term. This has forced the group to abandon their proposed share buy-back scheme, impair assets and focus on cost management to salvage any potential improvement in profitability. Although we take some comfort in the Network’s regulated revenue structure (which should continue its stable revenue growth) its credit rating remains capped by the parent. This means the credit profile of the Network is tied to that of the group. Given our outlook, we believe negative credit risk migration (or the deterioration of the credit profile) is likely over the coming periods. Our valuation assumptions for this security are based on the security being redeemed (in full) at maturity (28 October 2020) and all interest payments being made in a timely manner. As Aurizon has a unique business model, we utilise comparably rated securities to determine fair value based on our fundamental view. Our analysis suggests the deterioration in credit profile is already priced into the security (at least partially) and we believe the margin offered is fair. For this reason, we maintain our recommendation at Hold but remain cautious of the challenging long term outlook the group and the network face moving forward (i.e. low global growth, viability of coal as an energy source). The primary risk to our thesis is a sharp deterioration in earnings driven by either a demand or supply shock to the Queensland coal market. However, reduced capital expenditure, strong customer credit profiling, limited contracting risk and increased fixed pricing are all key strategies that will offer some protection from counterparty risk should a material deterioration in the Queensland coal market occur. Diversification away from commodity haulage into other goods. This will reduce the Network’s dependence on the Queensland’s coal market. We note that this would require substantial funding. Management have outlined their disagreement over the weighted average cost of capital (WACC) proposed for UT5 with the QCA. This may disrupt revenue trajectory for the Network by increasing the uncertainty of MAR. BondAdviser is an independent research company that specialises in bonds and fixed income securities. We provide investors, advisers, brokers and institutions with research, data, education and tools to help them invest intelligently. Our service is delivered online via an easy-to-use portal. 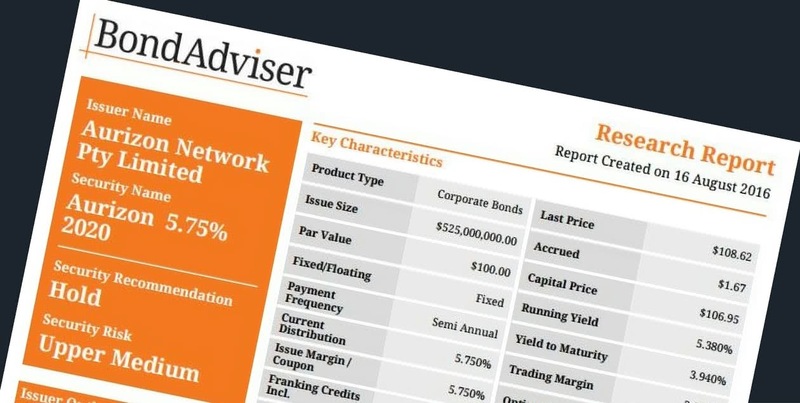 BondAdviser has the broadest coverage of retail-accessible ASX-listed and over-the-counter securities, including primary and secondary issues. Our expert credit team draws on its extensive experience and robust research process to deliver unbiased insight backed by detailed analysis. At BondAdviser, our goal is to lift the lid on the fixed income market so that more investors have the opportunity to invest in the asset class directly.